In the wake of 9/11 and hurricane Katrina, executives and policymakers are increasingly motivated to reduce the vulnerability of social and economic systems to disasters. Most prior work on 'critical infrastructure protection' has focused on the responsibilities and actions of government rather than on those of the private sector firms that provide most vital services. 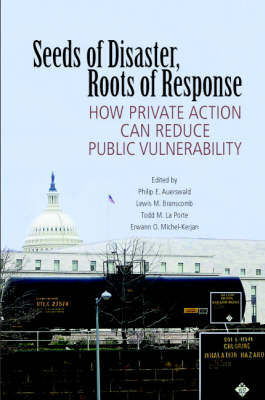 Seeds of Disaster, Roots of Response is the first systematic attempt to understand how private decisions and operations affect public vulnerability. It describes effective and sustainable approaches - both business strategies and public policies - to ensure provision of critical services in the event of disaster. The authors are business leaders from multiple industries and are experts in risk analysis, economics, engineering, organization theory and public policy. The book shows the necessity of deeply rooted collaboration between private and public institutions, and the accountability and leadership required to progress from words to action. "With 85% of America's critical infrastructure in private hands, the American people - and America's economy - are not going to be safe without strong, collaborative action by the public and private sector. Seeds of Disaster, Roots of Response is thus a timely and important volume that is a must-read for anyone concerned about our nation's security." Lee Hamilton, President, Woodrow Wilson International Center for Scholars and Vice Chair, 9/11 Commission.